President Trump’s executive order restricting travel from seven predominantly Muslim countries and halting refugee admissions left many refugee resettlement agencies wondering what was left of their mission. But they were undeterred. The parishioners of St. Michael’s Episcopal Church were armed with bed sheets, stuffed animals and hope. Preparing to welcome a Syrian refugee family of six, they still had to make up beds, hang shower curtains and stock up the pantry at the Austin apartment that had been rented out for the family — all part of their plan to prepare a house for strangers who would soon call it home. The Rev. Sherry Vaughan Williams, among those leading the west Austin church's volunteer efforts, was still concerned about finding a vehicle large enough to get the family from the airport — where a group of church volunteers would receive them — to the apartment without splitting them up. “Six people in one car is daunting,” she said Sunday evening. But by Monday morning, their hope had turned to heartache. The family’s flight, like those of several other families headed to Texas, was canceled after President Donald Trump signed an executive order that banned the entry of individuals from seven predominantly Muslim countries, halted the resettlement of refugees fleeing war-torn Syria and halted refugee admissions for 120 days. Despite the volunteers’ ample preparations, little was known about the Syrian family that was days away from calling Texas home. Officials could not disclose many details beyond their familial makeup — a mother, a father and four young daughters. The youngest was 2 years old. But in some ways the family's anonymity reflected the degree to which the sweeping executive order immediately upended the lives of countless refugees like them — unnamed individuals whose future was now unclear. They were people who had fled violence and terror. People who despite their despair somehow still won the lottery and were offered an opportunity to start over in Texas and elsewhere in the United States. People who with one signature lost all of that. The order, which was made in an effort to improve national security, also left refugee resettlement agencies wondering what was left of their mission. Despite the uncertainty, many were undeterred. Refugee Services of Texas, which was coordinating the arrival of the Syrian family, was expected to receive five families of refugees in Austin this week, but travel for the Syrian family and an Iraqi family of five was canceled following Trump’s travel ban. The 120-day shutdown of refugee admissions is set to go into effect Friday, but some flights were canceled immediately after the executive order was signed because travel for people from Iraq, Syria, Iran, Sudan, Libya, Somalia and Yemen was restricted for 90 days, said Erica Schmidt-Portnoy, Austin area director for Refugee Services of Texas. The organization still expects to receive three families this week. One is from Eritrea and two are from Afghanistan. 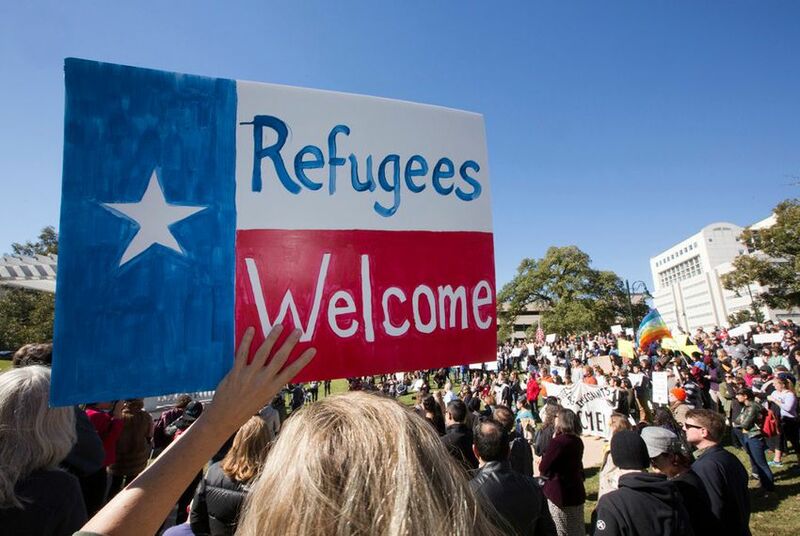 While a comprehensive list of canceled resettlements is not available, several refugees headed to Texas also saw their trips canceled. YMCA of Greater Houston received notice that travel had been canceled for two Syrian families scheduled to arrive Monday. In Dallas, the arrival of five families comprising 11 individuals from Iraq and Syria was also canceled. Because there are about 20 resettlement agencies in the state, it’s likely more trips were also canceled. And no arrivals are anticipated beginning next week. Those cancellations followed a weekend full of airport detainments and raucous demonstrations in Texas airports and across the country as Trump's executive order was implemented. At least 11 individuals were detained in Dallas and another was held in Houston. An Iraqi national headed to Houston where his wife and young son live was detained in New York. Despite the fallout, Trump’s administration has firmly held that the travel ban and refugee resettlement block is meant to increase national security. In signing the executive order, the administration indicated the delay in refugee admissions is meant to allow homeland security officials to review screening procedures — a concern conservatives have regularly pointed to in the last year amid the humanitarian crisis in Syria that’s displaced millions of people. But those used to welcoming refugees to the country say it’s hard not to feel like the door has been slammed in the faces of many people who won’t be able to easily get back in line when the program starts back up. Refugees are resettled in the U.S. after lengthy, stringent security screenings, including background and biometric checks, that can take up two years to complete. But all of those checks have to be current at the same time in order for a family to travel to the U.S., and many of those checks could expire in the 120-day pause, resettlement officials said. And because many of the refugee cases in the U.S. involve family reunification, the despair that comes with canceled trips has been extended to family members living in the U.S. who were expecting to soon be reunited with their loved ones. Trump’s executive order will significantly reduce the number of refugees resettled in the state because his administration is reducing the total number of refugees that will be resettled in the country in the 2017 federal fiscal year to no more than 50,000. The ban on refugee admissions means St. Michael’s Episcopal Church may be “out of the business for a while,” said Vaughan Williams. The volunteers are hoping they will still be able to put the donations they collected from their congregation for the Syrian family to good use — perhaps they will be able to pass them on to another refugee family. But some of the purchases were so personal that one volunteer seemed unsure about what to do with the two plush monkeys she had specifically purchased for the youngest of the Syrian girls. Trump's executive order banning travel from seven predominantly Muslim countries led to the detainment of several travelers at Texas airports over the weekend.